We’d like a chat. About something really important to us all. Education. Education should give every New Zealander the freedom and opportunity to be the best they can be. That’s the education system we want for the future. But to achieve it we need your help. Because education belongs to, and is about, all of us. That’s why we want all of you – children, young people, parents, teachers, employers, iwi, families and whānau – to have a conversation about building not just a better education system, but the world’s best. 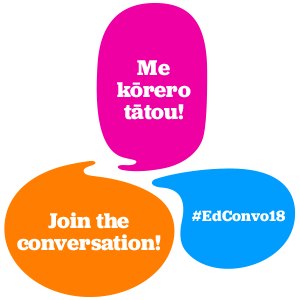 So come on, join the conversation spread the word to everyone you know – post publicly on Facebook and Twitter #EdConvo18.